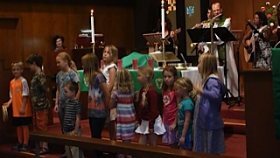 Holy Trinity offers Sunday School classes which teach bible basics and God's love in a fun, relaxed and encouraging manner with stories, songs, crafts and games. Sunday School is a Children's Church format, where the children will meet with teachers during the worship service to work on a craft, activity and/or song to help them understand the Bible readings better. Contact the office if you have any questions about Sunday School. Holy Trinity teams with Mt. Cross Ministries to offer a week of music, summer activities, games, spiritual songs, and fun for elementary school age children (ages 5-12) and is led by counselors from Mt. Cross. The week culminates in a program put on for parents by the kids on the Thursday evening of day camp week. Throughout the year, we have Family Fun Nights during different Holiday seasons. The evening includes a meal for families to enjoy together, singing, crafts and games. The goal is to help families learn and grow together in their faith.